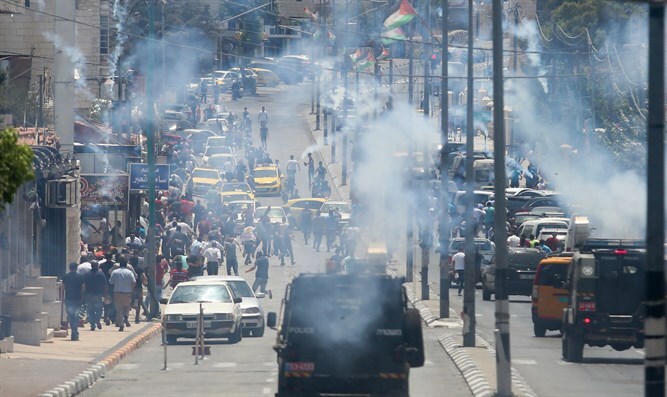 Arabs clash with police after Arab suspects die in clashes. Dozens of Arabs on Saturday threw stones at Israeli police forces in Jaffa. Two of the rioters were detained for questioning. The riot was caused by Arabs protesting the deaths of two Arab youths. According to Israel Police, the policemen were called to handle a shooting attack on Yefet Street, a main street in Jaffa-Tel Aviv. Upon arriving at the scene, officers noticed several moped riders attempting to escape onto Magen Avraham Street. The officers pursued them, and after a short time found the two moped riders, both of whom had bullet wounds. Magen David Adom transferred the escapees to Tel Aviv's Wolfson Medical Center, where doctors were forced to announce the death of one of them. Israel Police have opened an investigation into the matter, as is protocol, and the details have been transferred to the Unit for Investigating Police Officers. Channel 10 reported the policeman as saying, "We received a report of a shooting incident on Yefet Street, and our forces arrived at the scene, closed off the area, and began searching for suspects. Suddenly, three heavy mopeds came out of an alley and began to speed towards the officers." "One of the suspects went around me and started driving in the opposite lane. He lost control of his moped and fell. We then began to pursue them on foot as they ran into a side alley. The other suspect, who had previously escaped, attempted to get onto the moped his friend had fallen from. When he saw me, though, he ran back to where his friends were waiting for him." The officer then described shooting the suspect with a taser gun, then warning him again, and then shooting. "The suspect fell and I tried to handcuff him, but he got up, tossed me aside, struck the middle of my forehead with his helmet, and escaped. At that point, with no other option, I pulled out my gun, called to him to stop, and shot several times towards his moped's rear wheel. I didn't see that I had harmed him, and the three suspects quickly escaped. I only heard that there were shooting victims ten minutes later." On Friday, undercover forces in Judea and Samaria arrested Arab rioters, and on Thursday, Jerusalem police were forced to handle disturbances on the Temple Mount.